While visiting Belfast we took a tour to the Giant’s Causeway, which included a visit to the Carrick-a-Rede rope bridge. Carrick-a-Rede means the rock in the road. The road is the sea route for Atlantic salmon on their westward journey past Carrick Island. 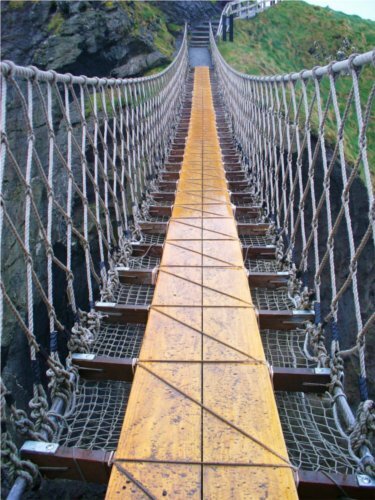 For over 350 years, fisherman have strung a rope bridge 30m above the sea to allow them to access the best places to catch the emigrating salmon. Hi, just wanted you to know I have saved you to my Google bookmarks because of your beautiful blog layout (LOL). But seriously, I think your site has one of the cleanest theme I’ve seen yet. It really helps make reading your blog a lot easier.